L.A. Guns -The legendary veterans of the sunset strip glam and sleaze metal scene are announced headline the Saturday stage at HRH Sleaze next September at 02 Academy Sheffield. The band are true warriors of the 80's genre and are geared up to tear it up at HRH Sleaze, promising to deliver the high octane Rock-n Roll that they are famed for. Backyard Babies, one of Sweden's most successful and bestselling rock bands are also confirmed to headline the Sunday main stage. They have several Grammy awards, gold selling albums and world tours to their name and HRH can't wait to see their sleaze rock swagger at the O2 Academy next year. The band officially reunited in 2014, five years after they announced that they were going on an indefinite hiatus. Plus more bands to be announced. 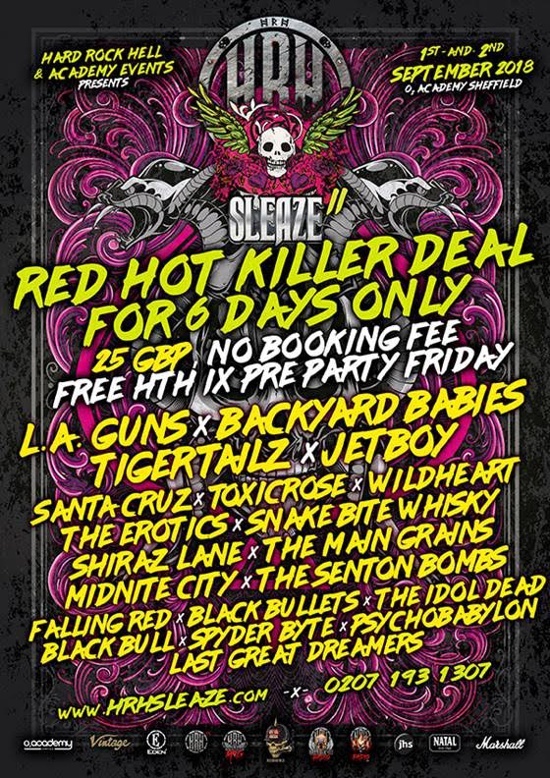 HRH Sleaze is already 58 % Sold from this year's event. To make it cool, we have a killer deal which is giving you more than 50% off, but only for 6 days and all subject to availability. 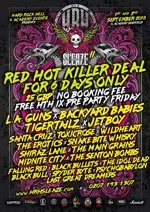 For 6 days only, the full weekend will be 25 GBP and no booking fee, Whats more we will be giving you the Friday night pre party, which is the 9th Cycle of Highway to Hell, Free of Charge Accommodation packages, which some include the Royalty passes for the upstairs balcony have a 35% discount for the 6 days It all finishes Monday 16th @ Midnight where they go back up to the normal price of 60GBP and no 35% off hotel packages...BUT, that's if there is availability. Sites have reduced rates on them, meaning you don't need a promo code, but its only for 6 days if you know your Sleaze then this is a weekend not to be missed. HRH Sleaze 2 will take place at the O2 Academy in Sheffield between 1st -2nd September, 2018. HRH Sells Out super-fast, so if you're clever, book soon to avoid disappointment, online at www.hrhsleaze.com, or ring Sam on 0207 193 1307.